When I caught Amir Bar-Lev's Fighter at the 2000 Newport Film Festival, it was staggering on jelly legs, having been rebuffed by a host of prestigious film festivals, including Sundance. But a much-deserved triumph at Newport for Best Documentary started a late-round comeback. Miraculously, every festival after requested to show this wonderful film, and First Run Features agreed to distribute it. Something I wrote in passing in the Phoenix became part of the early publicity: that the running conversations therein between Czech-Jewish American emigres Jan Wiener and Arnost Lustig  concerning history, philosophy, politics, family, morality  are the most savory and inspired in a film since the over-supper chit-chat fifteen years ago of Wally Shawn and Andre Gregory in My Dinner With Andre. Several Fighter viewings hence, I stick to my hyperbole about the energizing pleasure in eavesdropping on discourse this brilliant, funny, and enlightening. The kind of mini-parables with which Milan Kundera self-consciously salts novels such as The Unbearable Lightness of Being are what tumbles naturally from the lips of our two protagonists. Let me introduce them as they appear in the movie: Arnost Lustig, 72, a teacher at American University and a much-published novelist, who faces life with a crinkly-eyed smile, and gets by being amused by mankind's vulnerabilities and failings as much as by heroic successes. A concentration camp survivor, he served in Czechoslavakia's post-War Communist bureaucracy, though his Marxist idealism was put to test as he became aware of the horrors precipitated by the Stalinist government. He avows that personally he never sold anyone out, and this Weiner believes about him. Nevertheless, he paid lip-service to the Communist regime. A man needs to eat, to get by. Or does he? 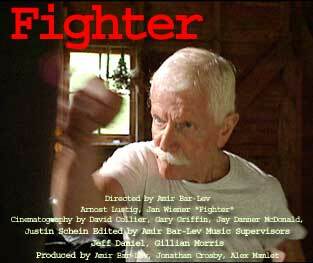 Not if he is Jan Weiner, the compulsive "fighter" of the title. He's 78, lean and mean, Errol Flynn-handsome with a beautiful snowy mane and mustache, and he's spent a lifetime refusing to back down about anything anywhere on earth. While Lustig worked and resided in Communist Prague, Weiner was breaking rocks in a harsh Czech prison. A pilot for Britain's Royal Air Force battling Hitler, he was arrested after the War when he went home to Czechoslavakia. He was framed by Communist police, who accused him of spying for England. Weiner being Weiner, he wouldn't sign a paper admitting anything, even as he was beaten and jailed. And this is the essential debate between these septuagenarians: can a life be lead totally without compromise? For Lustig, small accomodations are part and parcel of being in civilization. For Weiner, principle is everything, at all times, and there's no place in his heart for forgiveness of transgressors, even as the years pass. Therefore: Lustig is reminded forever by by an accusatory Weiner that he was "part of the club" in the Czech 1950s: guilty, guilty! They have been great friends in the United States, but their amity crumbles on camera in the process of traveling to Europe to make Fighter. Lustig and Weiner had signed on to participate in a road-movie documentary, retracing Weiner's Hitchcockian escape in the 1940s from the Germans in which he, among other happenings, fled through Italy riding underneath a train. As they travel from Prague southward, the two bitterly quarrel. Somewhere in Italy, Weiner abruptly divorces himself from the movie. A saddened Lustig has the final thought: "Fighters are good in time of war, maybe not in time of peace. We are too different for friendship."